An evening that was intended to mark the ten year anniversary of the Walt Disney Concert Hall — a panel at the now venerated hall co-hosted by KCRW’s Warren Olney and Frances Anderton — turned into an animated discussion about the future of Grand Avenue, with guests Frank Gehry and Eli Broad returning repeatedly to the theme of the Related Companies’ Grand Avenue project, and Gehry’s role in the design. Listen to an excerpt from the conversation here (it opens with Frank Gehry saying what he feels about the hall, ten years on), and read more on the story, and listen to the entire conversation, below. On Wednesday, October 2nd, KCRW and the LA Phil marked the tenth anniversary of the Walt Disney Concert Hall with a panel discussion in the hall, featuring architect Frank Gehry, businessman-philanthropist Eli Broad, LA Times architecture critic Christopher Hawthorne and Deborah Borda, president and CEO of the LA Phil. The evening was introduced by Mayor Eric Garcetti. The conversation was fascinating and candid, dwelling less on the agreed-upon glories of the hall than on its role in the in the multi-decade effort to transform Bunker Hill into a popular cultural and commercial destination. Among highlights: Gehry talking about his efforts to open WDCH to the street and a wider public, and how they were thwarted by bureaucracy; and Deborah Borda debating the merits of trees on Grand. But the topic at the heart of the evening was the Grand Avenue project. This is a long-anticipated complex of hotels, shops and public spaces to be located on “Parcel Q” East of Walt Disney Concert Hall that would form a closer connection between Grand Avenue and the bustling Arts District, considered an essential component if Grand Avenue is to fully become a hub of activity. Frank Gehry’s office had been attached to the project but his scheme (below right), which included a Mandarin Hotel and was contingent on buy-in from high-end stores like LVMH and Apple, was dropped during the recession. The plan was recently revived in a scaled-back form, with master planning by the local office of architecture firm Gensler, along with East Coast architect Robert AM Stern, known for a historicist architectural style. 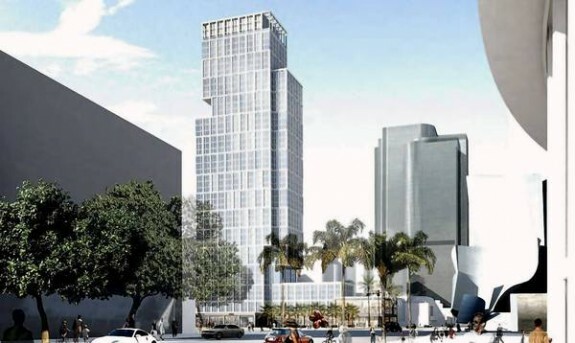 But that version was sent back to the drawing boards after Los Angeles County Supervisor Gloria Molina and the Grand Avenue Authority surprised developer Related Companies last week by “severely criticizing and temporarily rejecting its plan for a retail complex crowned by hotel, apartment and condo towers.” They criticized the scheme “as uninspired and overly commercial,” reported the LA Times. The developers pointed out this was only a preliminary scheme. But after that vote, it looked as if the project might collapse altogether. Speculation became fact during the discussion, as a chipper Frank Gehry assured a large audience he will, with Broad’s support, be involved in the Grand Avenue Project again. Eli Broad, whose own Broad museum is under construction next door to the concert hall, backed him up. 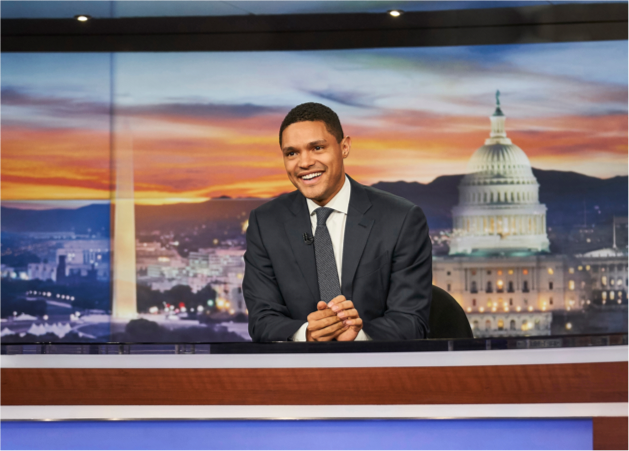 The last minute appearance of Mayor Eric Garcetti, who introduced the evening, appeared to seal the deal in a scene playing out before an enthralled audience that was somehow reminiscent of a drama in which the young gun gives respect to two OGs. The powerful architect and businessman-philanthropist engaged in a mutual lovefest during the discussion. 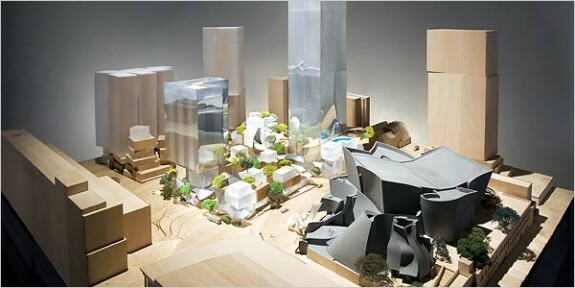 Daly is referring to the view shared by many in the architecture community in LA that local young and mid-career architects are not getting access to large civic projects that would showcase their talent, just as Gehry himself once got a chance at a breakout project, the Walt Disney Concert Hall. Deborah Borda reinforced this view, saying how essential it was that the Related development on the opposite side of the road be “aesthetically and intellectually” compatible with the concert hall. If this were to be achieved she said, then finally the area would achieve the “combustion” it needs to come alive. 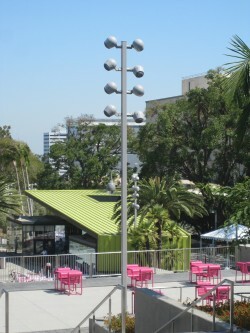 The panel agreed that the other essential piece of the puzzle was Grand Park, which opened last year, and is widely regarded as a successful transformation of an extremely difficult site, which scales 150 feet between City Hall and the Music Center, and is walled in by the overbearing County Hall of Administration and County Courthouse. Just this week, the American Planning Association (APA) designated Grand Park, designed by Rios Clementi Hale Studios, as one of its ten “Great Public Spaces” in America. The park has brought to that arid part of the cityscape greenery and vivid color and repose, as well as public music and events, and, perhaps most importantly, areas for exercising downtown’s growing population of dogs! (Historical note: Bob Hale, project designer on the park, was a design principal at Gehry’s office in an earlier stage in his career and worked on the concert hall and on an unbuilt plan for the site now known as Cal Plaza). Read this article for more background on “Parcel Q” and other mysteries about the much-discussed Grand Avenue. Listen below to the entire conversation, starting with Mayor Garcetti’s welcome. He was introduced by Warren Olney. Parcel Q was also revisited this past Thursday on Which Way LA, with Gloria Molina, Craig Hodgetts and Christopher Hawthorne, in conversation with Warren Olney. For fascinating background on the flawed efforts to redevelop Grand Avenue, from the fact that it used to be called “Charity Street” through to 50 years worth of unbuilt plans, check out “Grand Illusion,” a book based on a research studio at USC School of Architecture that I conducted with students and partners at Frank Gehry’s office.